The term “soccer mom” has come to mean women of a middle class background who are generally conservative and basically focus primarily on being a homemaker. Among their tasks are the maintenance and upkeep of the home, and driving kids to and from soccer matches and other sports. The "hockey mom" is a slight variation of the theme, a concept that was introduced by Alaska Gov. Sarah Palin. In a speech in front of the Republican National Convention, Palin gave herself this label in order to differentiate herself from the traditional image of a soccer mom. Hockey moms are typically from the colder parts of the country where hockey is a more common athletic pursuit than soccer. Soccer moms on the other hand live in warmer places, where outdoor sports such as soccer are the norm. Hockey moms are also generally from higher income families, with surveys showing that households in which hockey is played generally earn twice as much as the average family in the United States. This is reflected in the costs of enrolling kids into hockey training programs, which can cost as much as $1,850 a year in Alaska, not including the costs of equipment. Hockey moms generally have to wake up earlier than soccer moms, since it is a lot harder to find free time on the ice than it is to find a free soccer field. This is also why many hockey teams have to schedule practices before the start of school. Hockey moms are also seen as being more intense than soccer moms. This can be seen in their commitment to the sport and the fervor in which they cheer on their teams. Because of this, the USA Hockey commission has in fact introduced a "Relax, It's Just a Game" campaign, in which the goal is to get hockey moms to relax the pressure a bit. While the "soccer mom" group has not been clearly defined with regard to backgrounds, it is generally thought that soccer moms are comprised of a much more diverse group of individuals. 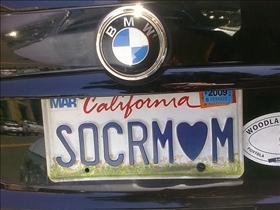 Of course soccer moms far outnumber hockey moms, simply because they have been around longer. U.S. Youth Soccer for instance has over 3.1 million players, and a large number of this corresponds to the soccer mom population. Elsewhere in the country, it is thought that soccer moms outnumber hockey moms by anywhere from 7 to 20 times. Which group of moms is most vocal at games?